Some GlobalLab projects require precise measurements of natural or human phenomena. We use probes to measure and capture this information. The following explains how to submit data to Report Forms using probes that GlobalLab does not support and those that GlobalLab does support. You can use probes from any manufacturer with GlobalLab. However, you will need to manually enter the data, except for probes that GlobalLab specifically supports. These are probes from Fourier and Globisens. With probes from these two manufacturers, you can autostream, or directly upload data, to the GlobalLab database. How do I upload data using Globisens Labdisc probes? Each Labdisc comes with up to 15 built-in probes, so you need to choose the specific probe you want to use. Refer to the Labdisc manual for this step. Transfer the data from the probe into the GlobiLab application on your device. Refer to the Labdisc manual for this step. Send the data to GlobalLab by clicking the “GLOMIR” button in the GlobiLab application. You will be asked to enter your GlobalLab username and password (refer to the screenshot). Use a browser to sign into the GlobalLab site. Navigate to the project’s Report Form. In the Report Form, there is a field for the data that you uploaded. You will see the data stream that you uploaded, along with the time and date when the measurements were made. If you used the Labdisc probe to conduct several different measurements, the field will contain a list of the data streams. Each stream will display its time and date (refer to the screenshot). Choose the stream you want for the Investigation, answer the Report Form questions, and submit the Report Form. The data you entered will appear in the Findings section of the Investigation. How do I upload data using Fourier probes? 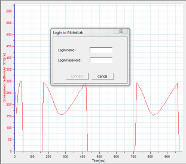 Use the MultiLab program (included in your Fourier sensor package) to submit data directly to GlobalLab. You need a device that runs Mac OS, Windows, or Linux. Make sure you have MultiLab 1.64 or later installed in your computer. Connect the probe to your computer to transfer data to MultiLab. You can link Fourier probes via USB, or NovaAir (Bluetooth-adapter). Refer to the Fourier User Manual for this step. Select GlobalLab in the Logger menu and then click on Login to GlobalLab (refer to the screenshot). Enter your GlobalLab username and password and click on Connect. Go to the Logger menu again and select GlobalLab. Click Start Upload to submit the data. Your data will be stored in GlobalLab database under your user account. Now you can go to the GlobalLab website, sign in, and go to the Report Form of the Investigation you collected data for. If you used the Fourier probe to conduct several different measurements, the field will contain a list of the data streams. Each stream will display its time and date (refer to the screenshot). How do I manually enter data? In the Report Form, there is a field for the data that you uploaded. You will see a field labeled “insert data manually” (refer to the screenshot). Simply type your finding into the field. Answer the Report Form questions, and submit the Report Form. The data you submitted will appear in the Findings section of the Investigation. How can I make a project that requires probes? If you want to make a project that requires some data from probes or sensors, you need to add a special question(s) to your project Report Form. To do so you will need to click on Add a question button in your project draft Report Form and then select Sensor or probe input from the Type of question dropdown menu. How can I see data I have submitted? Open the project page you have submitted your Report Form to and go to the Findings page. In a new window you can see your Report Form with the data you have submitted.